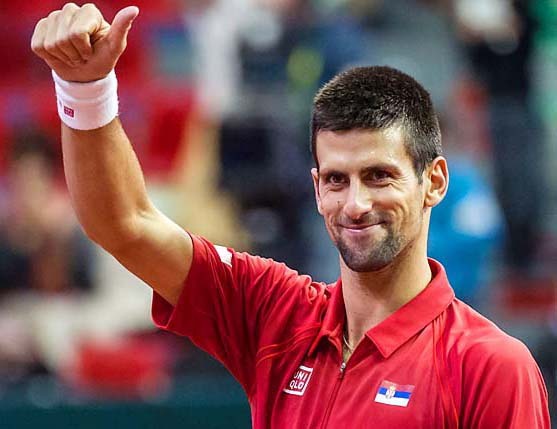 Shanghai, Oct 12 : Defending champion and top seed Novak Djokovic reached the final of the Shanghai Rolex Masters with a 6-2, 7-5 victory over seventh seed Jo-Wilfried Tsonga of France here Saturday. The Serb will take on either World No. 1 Rafael Nadal or sixth seed Argentine Juan Martin del Potro, who play their semifinal later Saturday, reports Xinhua. If the Spaniard wins, the final will be the 39th meeting of the Nadal-Djokovic rivalry, which is the most in the Open Era. The two last met in last week's China Open title match, which Djokovic won 6-3, 6-4. Djokovic just needed 10 minutes to storm to a 3-0 lead in the opening set but late on had to deal with a strong challenge from the Frenchman. Djokovic once led Tsonga 4-2 in the second set before the Frenchman staged a comeback which including saving one match point in the final game. He was unable to fend off the second one as Djokovic sealed the victory in one hour and 33 minutes. It's important for me to get into another final," the Serb said in a post-match television interview, adding that he was pleased with his return game and serving at key moments. "My serving was very controlled, very efficient. I was trying to open up the court and move him around. I know he likes to have targets, he likes to play from the backhand corners so I tried not to let him into that comfort zone." Tsonga admitted he didn't serve well enough to cause the World No. 2 enough trouble. "I played well in the second set but I know I can play a lot better so I will continue to work."